This book has a simple layout with large colorful illustrations. Each page has a theme and is set up a little differently to accommodate the topic. On the colors page, the images on the right side of the page match with the full images on the left as they are seen in the real world with simple words underneath to describe them. For example, a blue bath tub is seen in the blue bathroom among other items that can also be found in a bathroom. Children will easily make the connection between the smaller images and colors and will begin to hunt and see if they can find them in the larger image of a house. The same concept will go for shapes as two pages are littered with images of a scene where specific shapes can be found. For example a city with busy streets where simple shapes lurk in every corner from storefronts and tall buildings to vehicles with fun characters inside. As the author shows the images being taught, children will instantly want to find them throughout the pages. 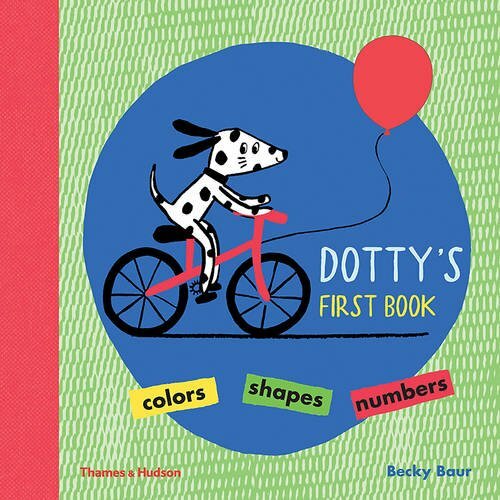 Dotty the Dalmatian is the main character, and readers will see her hiding among the images on her learning adventure. This board book is a perfect learning tool for children between the ages of two and four who are beginning to learn words and can identify pictures. The images are not too complex but alive with color and simple in design. The author’s unique style shines through on the pages as the text and images engage children. The 14 pages of durable construction will last a long time in the hands of little ones and their parents.